Want to see what else I'm craving for fall? Follow me on Lyst here! Love #4. those earrings are amazing! 2, 3 and 4 are right up my alley. those boots are drop dead gorgeous! love them all ! you have such a classy taste ! Loving the pink Charlotte Olympia clutch!!! Perfect for the day and night! That skirt and tee are a must. Love it! Yup, all good pieces. 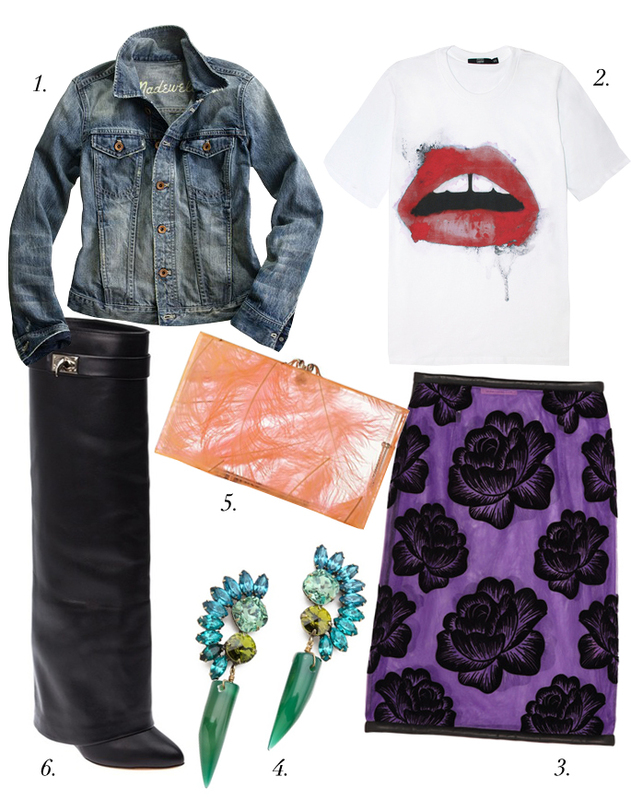 The skirt and earrings are my favourites! I'm convinced that some designers create pieces that are so crazy expensive and so aesthetically unappealing that no person in their right mind would ever consider them just to see if fashion bloggers will buy them. There's a few every season, like the hideous Alexander Wang cape shoes or the nonsensical feathered blazer. The Givenchy boots are this year's joke. the rocky horror-esque tee is totally rad. nice inspirations/wishlist! especially the second one looks gorgeous! 1, 4, and 6 are my faves. Those boots are too die for, but as you say they need to go at least 75% off to be in my budget. I bought the Zara imitations, i just wish they were more like the real deal. I cannot wait to be wearing my denim jacket all the time! I love this skirt and the funky tee..I always love funky tees and will have to pair it with something pretty...so thanks!